The purpose of the American Association of Law Libraries vendor relations policy is to direct the Association’s advocacy on issues related to legal publishing and legal publishers. The policy provides guidance to the work of the AALL Executive Board, the Committee on Relations with Information Vendors, the AALL Staff and other AALL entities that interact with legal publishers and monitor issues relating to legal publishing. AALL supports the principle that no public or private entity should enjoy a publishing monopoly over any body or type of government information. 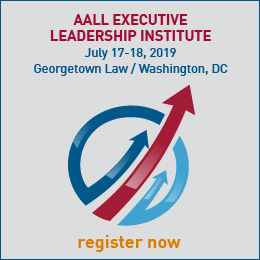 AALL supports the principle that no private or public entity should limit the dissemination of any level of government information through exclusive contracts, resale restrictions, or other restrictive trade practices. AALL supports a legal and regulatory environment that fosters an efficient and economical flow of electronic information to and from libraries. AALL supports a system of affordable telecommunications rates for libraries. AALL supports policies that ensure that legal and government information remains in the public domain and opposes database protection legislation that restricts the free flow of information. 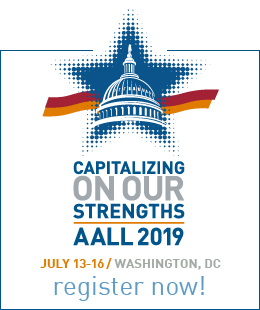 AALL supports a vendor-neutral and medium-neutral universal citation system for all government information. AALL supports copyright legislation that offers the fewest obstacles to the free distribution of government information in all media and formats. Furthermore, licensing regimes should not impose barriers to the access or use of information in the public domain, and should preserve fair use and other user rights promoting the dissemination of information and ideas. AALL supports the Federal Trade Commission’s Prenotification Negative Option Rule and advocates its expansion to include online subscriptions and digital materials for individual and institutional consumers. The AALL Guide to Fair Business Practices for Legal Publishers provides guidelines for legal publishers doing business with librarians and other consumers of legal information. AALL encourages all publishers of legal information to comply with the principles contained in the Guide. The Procurement Toolkit and Code of Best Practices for Licensing Electronic Resources provides guidance to librarians in their negotiations for access to electronic resources and informs vendors of electronic products about the licensing issues that are important in the library context. AALL encourages all publishers of electronic legal information to conform to these principles. The AALL Preservation Policy (1998) supports standards and guidelines that ensure the preservation of legal materials. The Association communicates the needs of its members for permanent, durable materials to publishers and vendors in order to increase the longevity of products offered to law libraries. The Association supports the design and use of coherent strategies for archiving digital information and adapting preservation to new technologies. The AALL Sponsorship Policy sets the parameters for a mutually beneficial exchange whereby the sponsor receives value in return for cash or goods- or services-in-kind provided to the Association. The Association has the right to refuse sponsorships provided by business entities that do not comply with AALL Guide to Fair Business Practices for Legal Publishers. AALL encourages legal publishers to provide non-aggregated, targeted usage statistics in compliance with the COUNTER Codes of Practice. Many of the publishing and customer services issues that are most critical to law librarians are covered by the AALL Guide to Fair Business Practices and the Procurement Toolkit and Code of Best Practices for Licensing Electronic Resources, noted above. The intent of the vendor relations policy is not to reproduce all those issues but rather to cite the resources that are already policy by virtue of their publication and adoption by the Executive Board. AALL supports transparency of prices and pricing structures for all media and formats. AALL supports simplified licensing models and pricing structures for e-books. AALL encourages legal publishers to seek explicit customer consent before shipping materials that supplement or are related to other services to which a library customer subscribes. AALL encourages legal publishers to consult with law library customers on significant potential publication changes, e.g. format, frequency, etc. AALL encourages legal publishers to coordinate the release of print and electronic versions of their publications. AALL encourages legal publishers to partner with companies providing electronic resource discovery and management systems to shared library customers, for improved bibliographic control and access to publisher products and services. AALL encourages legal publishers to allow their content to be discovered through the federated search engines implemented by their library customers. AALL encourages legal publishers to support standardized electronic data interchange for transmission of orders, invoices, claims and other related correspondence. AALL encourages legal publishers to maintain support for law library customers by assigning service representatives who have a knowledge and understanding of all product lines and familiarity with individual library accounts. AALL encourages legal publishers to maintain subscriber-paid content throughout the term of the subscriber’s contract and not allow that content to disappear from future contracts without notice.